A recent ad by Airtel has been making its rounds on Twitter. The Indian telco company released an ad in which a lady boss plays a dual role as both wife and the boss.In the ad, she first plays the role of the boss asking her employee to get his work done on time. After a long hard day, she then goes home and calls her husband (the same employee) and urges him to come home to a nice warm meal. Released on the 24 July, the campaign has already gotten over 380,000 views. The campaign, created by Taproot, is in line with brand Airtel’s larger positioning around enabling relationships – the campaign’s television commercial (TVC) is a thematic film with a contemporary take on the role that smartphones and data networks are playing in bringing millions of data savvy Indians closer to one another. “ ‘From ‘Express Yourself’ to ‘Har Friend Zaroori Hai, Yaar’ – enabling magical relationships have always been at the very core of Airtel’s brand values. Our all new campaign strengthens Airtel’s legacy of identifying fresh and relevant insights around relationships – and is a contemporary take on this very theme,” added Beotra. The TVC will run on all national TV channels with a strong digital push and will have a strong presence on static media platforms such as outdoor and retail. 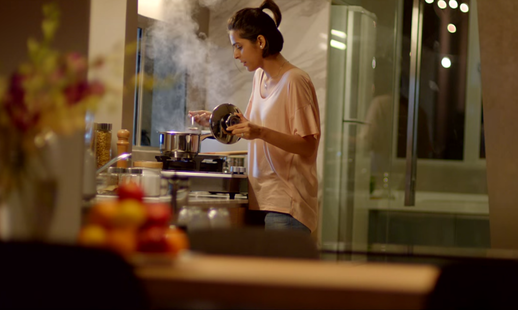 Y'all were outraging about the wife having to cook in the #Airtel ad? But she got to shower & de-stress while her husband is stuck at work. Why is the new #Airtel ad offensive/misogynistic? She didn't cook because she's the wife. She cooked because she got home early. To everyone, there are bigger and more important things to revolt against. I don't think the #Airtel ad is one of them. Just saw that Airtel ad and I'm appalled at the message it sends; for starters, 3G video calling is NEVER that smooth and hi-def. And yes I do agree that by no means should a woman have to go home and cook after a long day, but if she wants to – hey why not? The only complaint I have about the ad is that had I not known it was an ad for Airtel, I’d have probably thought it was an ad for one of those instant cooking masalas. Yummy. Hitting too close to home? Singapore - As competition heats up over a saturated customer pool, lead telcos StarHub and SingTel have launched campaigns with s.. Grab and Ant Financial Services Group, the parent company of Alipay, have partnered up to provide a cross-border payment solution ..